A differential measurement system has neither of its inputs tied to a fixed reference, such as earth or building ground. A differential measurement system is similar to a floating signal source in that the measurement is made with respect to a floating ground that is different from the measurement system ground. Hand-held, battery-powered instruments and DAQ devices with instrumentation amplifiers are examples of differential measurement systems. The following figure shows an implementation of an 8-channel differential measurement system used in a typical NI device. 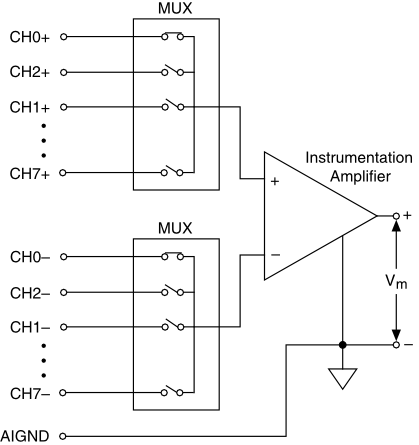 Analog multiplexers are used in the signal path to increase the number of measurement channels when there is only a single instrumentation amplifier. For this device, the pin labeled AIGND, the analog input ground, is the measurement system ground. Your signal source—floating or grounded—helps determine if you should use a differential measurement system.